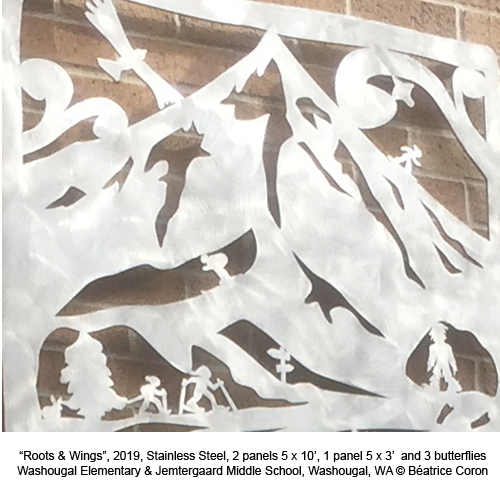 Roots and Wings is about growing up in Washougal, giving children strong roots in the beautiful setting of Columbia gorge. They will grow wings of education that will take them wherever they want to go. The three panels portray an imaginary scene combining local elements of history and geography. In this metaphorical environment children read books, exercise, go for field trips where they encounter live scenes of the past and grow wings of curiosity that transport them into their future life. I celebrate the power of learning. Education is a transformative experience—this idea is rendered in the children-butterflies’ images. Each long panel is depicting a growing tree, symbolizing each elementary school and Jemtergaard middle school. The center panel depicts the iconic Mt Hood. In the many vignettes one can regognize Lewis and Clark, the vista house, petroglyphs, Sasquash, the Metunah water fall. Beacon rock, Steigerwald wetlands, steamboat and many other sights. Each onlookers can imagine their own stories and share them with the community. Three small child butterflies (12 x 18”) are installed on adjacent walls. Each panel and elements are bolted 1” off the wall producing different shadows in natural light.